Accusing North Korea of "begging for war", the United States is drafting a United Nations Security Council resolution mandating more sanctions against Pyongyang, and will put it to the vote next Monday. 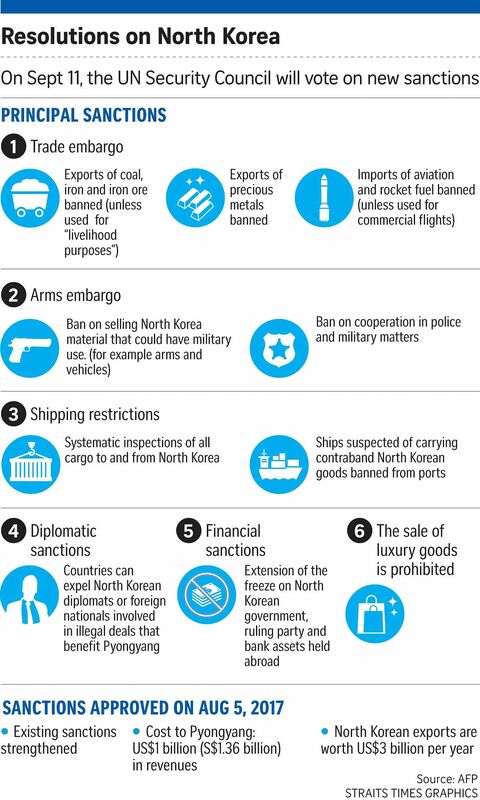 According to reports, the resolution - likely to be negotiated with US allies, as well as China and Russia - may strengthen sanctions on North Korean food, textile and labour exports, and financial institutions that do business with the North. Some experts have been recommending that North Korea's state-owned Air Koryo airline should be sanctioned. But most importantly, the US is pressing for curbing oil supplies to the Pyongyang regime. "A new resolution could prohibit North Korea's export of labour, requiring that all the essentially slave labour be sent home; it could ban North Korea from exporting food; and it could impose a fuel ban," Mr Joshua Stanton, a Washington- based attorney and expert on sanctions on North Korea, told The Straits Times. Oil is essential for North Korea - analysts estimate the state would grind to a standstill in a few months if supplies were cut off, but this would also create immense hardship for innocent North Koreans. In any case, a complete ban on oil is difficult to envisage or implement. In any case, a complete ban on oil is difficult to envisage or implement. China is North Korea's primary source of oil, and has already been reducing its exports. But it is seen as unlikely to cut supplies entirely for very long as that would create instability in North Korea, which borders China. Meanwhile, Russia, whose relations with the US have almost reverted to Cold War-era hostility, has reportedly been making up shortfalls by exporting oil to North Korea. At a summit of the Brics nations - Brazil, Russia, India, China and South Africa - in Xiamen, China, Russian President Vladimir Putin said sanctions would be useless, beyond making millions of people suffer. "They would rather eat grass than abandon their (nuclear weapons) programme unless they feel secure," he said of the North Koreans. Diplomacy is the only answer, he added, warning that ramping up "military hysteria" could lead to global catastrophe. His remarks came after Ms Nikki Haley, the US Ambassador to the UN, told the UN Security Council on Monday: "We must now adopt the strongest possible measures." The session came just a day after Pyongyang successfully tested what it called a "missile-ready" hydrogen bomb in its most powerful nuclear test yet. "Enough is enough," Ms Haley said. "We have kicked the can down the road long enough. There is no more road left." UN member states are obligated to use their domestic laws to enforce the resolutions. Eventually, analysts say, it would devolve to the US and its allies to vigorously implement sanctions. "We know what the problem is, which is Russian companies and individuals, and in the case of China, Chinese banks, that are facilitating North Korean sanction evasion," Mr Anthony Ruggiero, a sanctions expert and senior fellow at the Foundation for Defence of Democracies in Washington, told The Straits Times. "I cannot envision a scenario where China and Russia allow their own companies and individuals to be sanctioned by the UN." UN sanctions are only a foundation, he said, adding: "On top of it has to be US sanctions and diplomatic efforts to build a like- minded coalition that will move the ball forward." In an e-mail bulletin on Monday, non-governmental organisation International Crisis Group wrote: "The unanimous passage of another UN Security Council resolution would be welcome, but - as evidenced by Pyongyang's response to the last such step - clearly insufficient." "The focus ought to be on unified deterrence and diplomacy, in particular reaching agreement on the principle of initiating talks with Pyongyang, even at the price of controversial concessions such as removing any precondition or barrier to negotiations. There is no other viable way forward," it concluded.